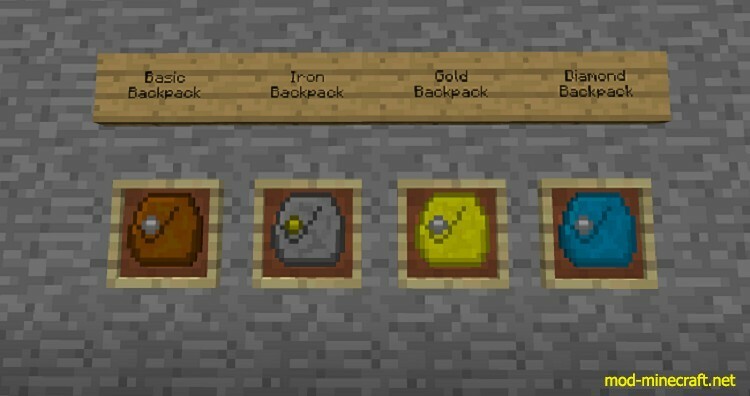 Iron Backpacks Mod 1.12.2/1.10.2 attempts to address the issue of portable storage in a balanced, fun, and aesthetically-pleasing manner. 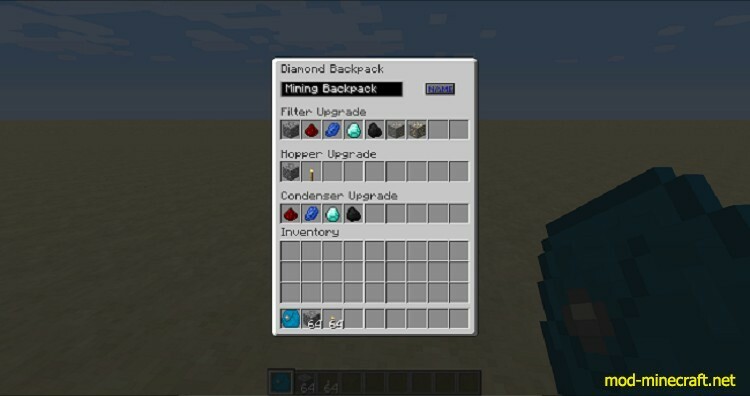 This mod provides Minecraft players with tiered backpacks (Basic, Iron, Gold, and Diamond), each of which can be upgraded from the previous tier to give more storage room and more upgrade points. These upgrade points can be used to apply a number of upgrades (over 20 different ones) to the backpack to improve its functionality. In addition, an extensive configuration file is included with this mod allowing you to customize nearly every aspect of the mod if you feel as if my recipes/backpack sizes/default settings/ does not fit into your idea of balance. Each backpack has two GUIs (graphical user interfaces). The default GUI which stores all of your items is accessed by right clicking. The alternate GUI is accessed by shift-right clicking, and it will display the alternate GUI upgrades (if applicable) such as the ability to rename your backpack. In addition, when a backpack is open, right clicking another backpack in the player’s inventory or in the original backpack. It will open that backpack’s GUI directly (yes this works with nested backpacks). You can also do this with ender-storage backpacks. When the backpack is upgraded to the next tier (ex: gold -> diamond), it keeps its inventory and any upgrades it had. The same thing happens (keeps it’s data) when an upgrade is applied (shapeless crafting). 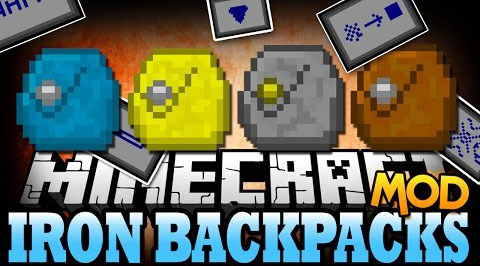 Finally, you can equip any 1 backpack at a time. To do so, use the keybinding for “equip backpack” (‘B’ by default). If you are not already wearing a backpack, the backpack item currently selected in your hotbar will be equipped. To take it off, simply press the same key (but you must have an empty slot in your inventory). To access the equipped backpack, simply press the correct keybinding (‘R’ by default). To remove an upgrade, simply craft the backpack with the upgrade you want to remove. 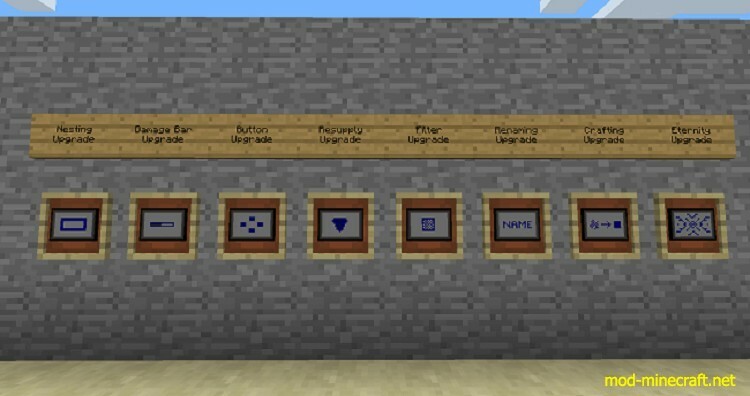 Crafting – Adds 9 slots to the alternate GUI, each of which can have 1 item in it. Whenever you pick up an item, each item in the backpack will check if it is also in a condenser slot, and if so, will try to be crafted into a condensed version. For example, if you have redstone in the condenser slot, and 64 redstone in your backpack, when you pick up an item you will now have 1 redstone and 7 blocks of redstone in your backpack. This upgrade will sort your backpack after it condenses an item. This upgrade works fine with the filter and restocking upgrades. Damage Bar – This upgrades adds a damage bar to the backpack which reflects how full it is (in regards to it’s total capacity), meaning that you can simply glance down at the backpack to get a quick visual representation of how much space you have left. Basic – It will check for the exact item in the filter slot(s). Fuzzy – It will ignore damage values. Ore Dictionary – It will not check for the exact item, but rather for any item that is registered in the ore dictionary that the item in the filter slot(s) is also registered to. Mod Specific – It will not check for the exact item, but rather for any item from the mod that the item in the filter slot(s) is from. Groups vanilla Minecraft items together as a “mod” for this purpose. Mining – This upgrade automatically picks up any ores, and has 9 open slots for gems to be placed into. Advanced – This upgrade has 18 slots instead of 9 like the other filters. You can rotate through the slots by either clicking the arrows on either end or by scrolling your mouse wheel in any of the advanced filters’ slots. Each slot can be configured to be either exact, fuzzy, ore dictionary, or mod specific matching by clicking the button below each slot. Resupply – Adds 9 slots to the alternate GUI, each of which are composed of ghost slots (that don’t take your item). This upgrade applies whenever you pick up an item. If the backpack contains the item that is present in any resupply upgrade slot (in the alternate GUI), the backpack will attempt to refill a stack of that item if it is present in your inventory. For example, putting torches in a resupply slot will allow you to constantly have 1 stack of torches in your hot-bar. (Advanced) Nesting – The nesting upgrade allows you to put as many backpacks of any previous tier as you want inside this backpack. The advanced version allows you to put any backpack inside of it, including backpacks of the same or greater tiers. Note that you can right click any backpack inside any other backpack to directly open it. Depth – This upgrade allows an equipped backpack to have the upgrades applied from any backpacks inside of it to still function. For example, say you had an Iron Backpack (with a mining filter upgrade) inside of a Gold Backpack (with a nesting upgrade obviously), and you had the gold backpack equipped. Then, when you picked up an ore it would go directly into your Iron Backpack (even though it is nested inside your Gold Backpack). This only works with one nesting (i.e. you couldn’t put another backpack inside the Iron Backpack and have that one pick items up). Check out the video in the spotlights section on for more information. Quick Deposit – This upgrade allows the player to shift right click on any inventory to deposit the contents of the backpack into said inventory. For example, you can come home with a backpack brimming with items after a mining trip, and instead of manually clicking the items into your (sorting) chest you can just shift right click the backpack’s items into the chest. Note: Currently doesn’t work directly with Applied Energistics terminals, to get around this you can deposit into an ME interface. I will try and fix this in a future update. Renaming – This upgrade only appears if you have the config option “renaming update required” set to “true”. 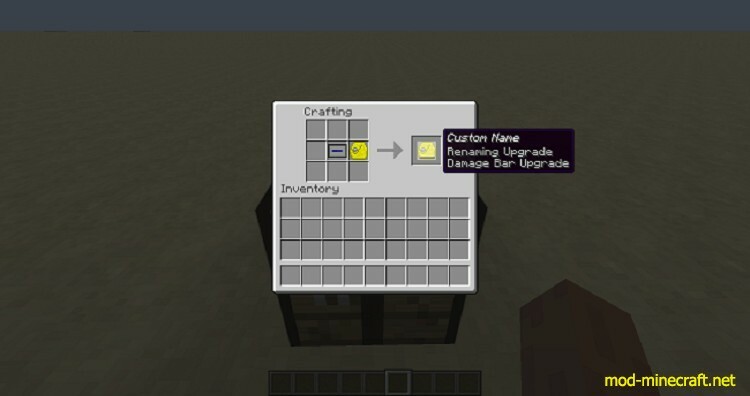 If you do, then this upgrade will add a bar in the alternate GUI where you can type in a new name for the backpack and then rename it (much like in an anvil). If the config option is set to false, this upgrade will be applied by default. Eternity – Allows you to keep the backpack and all of it’s contents when you die. However, the upgrade will disappear after this, you will have to make and apply a new one if you want the upgrade again. Additional Upgrade Points – This upgrade adds a (configurable) amount of upgrade points to the backpack, and can be applied a (configurable) number of times.